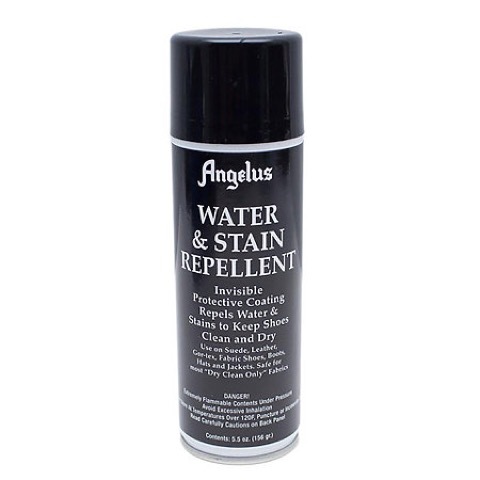 When properly applied, Angelus Water & Stain Repellent will provide an invisible protective coating that repels water and stains to keep leather, suede, Gore-Tex, and many fabrics clean and dry. Safe to use on Dry Clean Only fabrics. Recommended Use: Surface to be treated must be clean and dry. Apply 2-3 even coats to the desired area. Allow about 30 minutes of dry time in between coats and let completely dry before wear (at least 12 hours). Note: Excessive spraying may temporarily darken some color and natural leather. Quick Tip: If using Angelus Dyes, apply Water & Stain Repellent once done to help minimize bleeding.